Kanye West: in the last month he's compared himself to Steve Jobs and God and he became a dad for the first time. 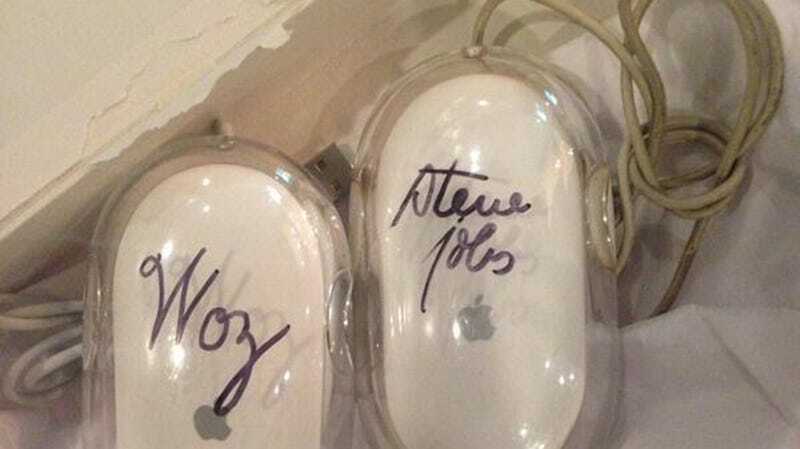 So it's fitting that on Father's Day this year, he was the proud recipient of a pair of Apple mice signed by none other than Jobs and Woz, according to a picture Yeezy posted on Twitter. Between this and having been one of the first people to already meet Kimye's baby, Steve Wozniak is probably shortlisted for a guest spot on the next G.O.O.D. Music compilation. I signed this mouse right in front of Kanye, after chatting and joking with him for an hour or two, right in the hospital where Kim had given birth. I included a couple of other gifts. Kim went as far as she could to do the best things she could think of for Kanye and I'm impressed with her. I'm lucky to have the same with my wife Janet.